- Banters with Faldorn, Branwen, Kivan, Neera, Xzar, Xan, Dorn, Edwin, Eldoth, and Tiax. If you find a bug that isn't on the "known bugs" list that you think may have originated in this mod, the best place to let me know would be on the Baldur's Gate forums thread at: "https://forums.beamdog.com/discussion/15586/". - Alpha v1 ("v0.01"): Initial alpha release. - Alpha v2 ("v0.02"): Fixed kit ability issue. Modifed Helarine's starting inventory. Added 3 new Branwen banters. - Alpha v3 ("v0.03"): Fixed a number of bugs. Removing Helarine from the party with send her to Friendly Arm Inn. Added 9 new banters (3 Edwin, 3 Eldoth, 2 Dorn, 1 Dorn romance reaction). Separated friendship track from plot reactions. Reduced scroll of protection from undead to one use. Added plot reactions for chapter 4, 5, and a specific scene in chapter 6. - Beta v1: Added a new friendship track conversation and banter accelerators for all available banters. - Beta v1 hotfix: Reuploaded the mod with a few fixes from WhiteAngus. When asked about her past, Helarine becomes quiet and hugs herself tightly. She explains that she once was the servant of an important deity that perished during the Time of Troubles, but refuses to specify which one. Unwilling to relinquish her divine powers, she began her service to the new God of Death, Kelemvor. She claims that she had to go through a significant change of personality to adhere to Kelemvor's wishes, but she doesn't tell you what she was like before her conversion to Kelemvor's clergy. Once the tale is told, she becomes distant and formal once more, leaving further questions unanswered. Helarine is cold and aloof, preferring to stay out of the spotlight. When she does talk, she seems to have an obsession with death, and will steer conversations to the subject of mortality. She shifts into a preacher's role when people downplay or refuse to acknowledge the nature of death, but is otherwise calm and formal. Before the Time of Troubles, Helarine was the daughter of a priest of Bhaal and had begun her training as an acolyte. Once the Godswar began, she and her parents took it upon themselves to kill the followers of other gods to live up to the expectations of the Lord of Murder. After Bhaal's death and Cyric's ascension, Helarine barely escaped the murder of her family by followers of the Dark Sun. Angry and spiteful, Helarine hid away and planned to avenge her deity's death. After the Time of Troubles ended, Helarine began to hunt down followers of the new God of the Dead, Kelemvor. She was killed by one of the clerics she attempted to murder, and her soul was greeted by Kelemvor in the Fugue plane. As her patron deity was dead, Kelemvor was duty-bound to force Helarine's soul to be attached to the Wall of the Faithless, but he offered her a chance to convert. Planning on double-crossing the god, Helarine agreed to take him as her new patron and allowed herself to be raised by the very priest she had tried to kill. As time went on however, she began to feel her personality shifting to match her patron deity, and while she suspected that Kelemvor's priest had placed a geas on her she didn't resist the change. Over the years since her conversion, she has travelled the Sword Coast from Luskan to Baldur's Gate. When the Sword Coast iron crisis begins, she finds herself at the Friendly Arm Inn, and waits there patiently for the problem to smooth itself out. As of right now, this mostly means "Helarine will mention this in one conversation and then leave you alone." A draft of a very confrontational reaction to the BGEE romances (focused on the possiblity of death, of course) has already been written. I also plan to make Helarine comment on certain plot developments, such as clearing out the Nashkel mines and a certain reveal about the protagonist's past. Depending on how well I can code the conditions without a GUI conversation editor, I might also make a few more specific romance and plot reactions for Helarine. Note: For the time being, I only plan to react to core game plot states and BGEE romances. While a BGEE Doomguide kit *has* been created (here: http://www.shsforums.net/topic/55638-mod-bgee-kitpack/), I'm wary about using a mod to make a mod (and that's not even getting into figuring out if the mod author is okay with me using their work in my mod). I'm also not sure how to make a custom kit, so I doubt I'll be making such a thing very soon without a detailed tutorial. This goes with the reactivity thing as a "nice to have" element that I might not get to work right. According to the dialogue guide I've read it's a lot easier to make new interjections than in other games I've modded, but I'll still have to find a way to debug conversations I can't control. This is sort of the replacement of a romance track that I have in mind for Helarine. It probably won't show up much in BGEE, but in SoA and ToB Helarine's relationship with the player will potentially alter her alignment and loyalty to the protagonist. If the player works to understand the conflict Helarine has between her old patron deity and her new deity, they can influence whether she stays loyal to Kelemvor or tries to find another patron. 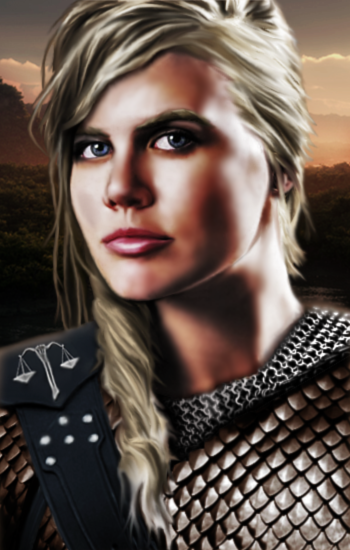 If the player is dismissive of Helarine, she becomes even more distant and cold and her loyalty to Kelemvor is assured. (As with interjections, this is a "nice to have" element that isn't necessary, especially in BGEE). When BG2EE comes out, I hope to create a continuation of this mod that completes Helarine's story arc. I suppose I can start writing it as soon as I'm done with the BGEE content, but I doubt it'll get far enough to release until I have some version of BG2 installed again. This is mostly for my benefit and the benefit of people who can't wait for release (or want to know if they should bother with this mod), but here's my plans for Helarine's story arcs. Hopefully if I get eaten by gibberlings tomorrow and can't finish the mod, at least this thread won't be a complete waste of everyone's time thanks to these plan summaries. Helarine notices the divine spark in the protagonist, but doesn't recognize what it means. She makes an excuse to join the party when met at the Friendly Arm Inn. She grills the protagonist about their feelings on death, trying to learn anything useful about the protagonist's mindset. Eventually, she realizes that she's being unfair and stops (though she'll start up again briefly if the player starts a romance). In an attempt to fit in again, Helarine shares some stories about her travels after becoming a Doomguide. Even in these she'll focus on the people she's seen die and performed funerals for, however. Once the majority of her stories are over, she'll offer to perfom the protagonist's funeral should they die (along with a separate offer for any romance interest). While Helarine will note when the protagonist's Bhaalspawn nature is revealed, she only makes a small comment about it possibly being what she saw in the protagonist when she was recruited. Helarine will be in Athkatla from the start of Chapter 2. If she was not recruited in BGEE (chosen by player), she won't repeat any of that content (she'll have learned of the protagonist's Bhaalspawn nature and basic tales of their travels). In her non-plot dependant arc, Helarine admits early on about her upbringing as an acolyte of Bhaal. If the player is dismissive of her in this conversation or later related conversations, she'll stop speaking of the topic and devote herself to Kelemvor. If the player is receptive, she'll tell stories about her family's attempts to honor Bhaal during the Time of Troubles. If the player finishes Shadows of Amn without dismissing or angering Helarine, her loyalty path will be open in Throne of Bhaal. Regardless of her loyalty track, Helarine will eventually tell the story of her conversion to Kelemvor (which will be slightly altered based on current loyalty). Helarine will also have a short friendship track separate from her loyalty conversations. These will be more generic conversations, and the track won't cut short if the player is dismissive. Helarine will also take note of core and BGEE romances, and have some comments based on the romance in question. Shortly after rejoining the party, Helarine will ask the protagonist how they feel about fighting their Bhaalspawn relatives. This conversation doesn't affect the loyalty track. If Helarine's loyalty track wasn't broken, she'll have 2-3 conversations that cement her personality for the endgame. She'll either be convinced to devote herself to Kelemvor (especially if loyalty is broken) or decide to be open minded and seek out a new deity. Helarine will also have a short friendship track and one final comment about potential romantic interests. Player becomes a god (good version), Helarine devoted to Kelemvor: Helarine is somwhat dismayed at the protagonist's decision, and will comment on what the protagonist must give up to become a deity. Helarine is appalled at the protagonist's decision, and vows to put down the protagonist once she's amassed enough power to kill a god. Helarine offers to become the protagonist's Herald and enforce their will. Her alignment will have shifted toward the player's on this loyalty track, and her offer will be altered by alignment. Helarine is surprised that the protagonist was willing to give up the power to become a god, but is pleased by the result. While I have Helarine's personal and plot-based story arcs figured out, I don't know what kind of banters and interjections are expected. Having only secondhand knowledge of some plot scenes in the BG series (I've only got as far as Chapter 5 in BG1 and SoA, and the rest of my knowledge is from guides and videos), I'm not sure where the major plot points are to insert the interjections. If someone could come up with the major points where core and mod NPCs are expected to have interjections, I'll make sure those are worked on. I'm also not sure what I should put in the player-initiated dialogue section. While I'm not adverse to adding flirts if people require that in an NPC mod, it'd be kind of awkward with Helarine since she's simply not interested in a romance. Aside from that, I can only think of basic questions to ask Helarine that would get old after the first use. I also might need an editor/beta reader to ensure I don't do anything [i]too[/i] lore-breaking. While I've played a lot of Forgotten Realms-inspired CRPGs, I'm not master of the FR setting, especially during the 2nd Edition timeline. And that's about it. If you'll excuse me, posting this kinda obligated me to writing 11 BGEE conversations and a few banters to live up to such a big plan. With only 3 drafted, that means I have some work to do. While I feel bad for risking putting a dampen on your modding spirit, I feel I need to point out that lorewise, Kelemvor did not become a god until the very same year that BG starts. @Jackkel_Dragon you are more than welcome to take my kit if you change your mind, I will be happy to provide you with the files and the install script, better that it gets as much use as possible. Obviously if you decide you still don't want to use it then thats fine too. Fascinating. I was under the impression that Kelemvor became a deity only shortly after the Time of Troubles. That's what happens when I go through 3+ sources and stop once I have what I need, since none of them had any dates or timelines. In that case, Helarine will have been a *very* recent convert to Kelemvor. I'll go through my stuff and see what needs to be altered for that to work out properly. Edit #2: Don't feel too bad for pointing that lore error out, scriver. While this particular one doesn't require a total re-write, I noted in my opening post that I'm not familiar with FR lore (particularly outside of the 3E sourcebook). Thanks for pointing it out. The starting year I've always seen for BG1 is actually 1368, and I'm pretty sure that's where the journal entries start... but Bioware was terrible with timelines, and inconsistencies abound anyway, so as long as you've got the events that got Kelemvor elevated to godhood correct (it's complicated and involves the insane shenanigans of Cyric, which you can find at the very least in the 2E lorebook Ruins of Zhentil Keep), I wouldn't worry too much about the dates. If you ever need help with the lore, this is one of the areas that I've done tons of research on for an NPC, so feel free to ask. I stand in awe. This looks very promising. I downloaded your mod from the link I used above and copied your Kelemvor kit info into my testing Tp2 file (with modifications to avoid player selection). If it's alright with you, I'll leave that in for release, since it seems to be working. That said, should I rename the interal ID to something else to avoid compatibility problems with your mod? I'm not familiar with how BG mods mesh together just yet, and don't want to cause bugs for people who have the playable version of your kit with my NPC mod. I've been drafting a few more BGEE conversations for Helarine, and the way I've been writing them suggests something for the "player-initiated" conversations. So far, only the first romance confrontation conversation is forced on the player, with one of the options at the beginning of the other conversations allowing the player to cut the conversation short. I'm thinking of taking a page out from NWN: Shadows of Undrentide and allowing the player to re-initiate these conversations they skipped from the player started dialogue. This, of course, would likely require some fancy scripting or near-duplicates of the conversations in question. It would also mean, due to how I'm structuring the BGEE conversation track, that the player would have to finish a skipped conversation BEFORE the timer for the next conversation on the track is set (potentially suspending the conversation indefinately). I'd like some thoughts on this. If it sounds too complicated for me or the player, I'll just re-write the "skip conversation" options to lead into the conversation like the other options. @Jackkel_Dragon I would definitely rename it, and change the prefix for the files from dp to somthing else unique to prevent overlaps. I switched the "DP" prefix to "HL" in every instance I found and commented out the segments related to ToB starting items. Hopefully that will keep the mods from breaking when used together. After testing the first 3 conversations, it turns out that my initial drafts were rather... short. So I've revised the first one to be longer and will hopefully get around to the other conversations soon. A snag I've run into: so far I've only tried using the < CHARNAME> token, but it's not been working. In the final in-game dialogue, it'll just show the token rather than the protagonist's name. I tried looking at a dialogue expansion mod I have installed to see how they did it, but they seem to have done exactly what I did, only got it to work. I'd rather not have to write really impersonal dialogue, but it's kinda silly to see scripting tokens in-game outside of debugging. Note: I'm posting a lot because I've got a lot of momentum on this project at the moment. Don't expect this much forum activity from me all the time, even when I'm working on the mod. Edit: I don't have the erroneous space in the token in my files, the forum just didn't let me keep the token in my post with the proper setup. @Jackkel_Dragon I had the same issue of the tags/tokens not working when I was doing the Sun Soul Monk kit. If you use the beta version of WeiDu it should take care of that. Unless I downloaded the wrong file from that thread, it didn't help me with my token issues... weird. I heartily support this project. Kelemvor is my favorite FR deity and I'm curious to see how she'll fill the role of doomguide, musing not only on the death of all living things, but the death of relationships, cultures and I assume in Shadows of Amn's sun temple, even deities. I'm still not sure which characters I'll make Helarine banter with, so I don't have any of those written yet. Personally I'd suggest at least one conversation per other cleric (on the subject of faith and why they chose that path), one for Xzar the necromancer (something she'd be firmly against, Tiax's Ghoul summoning should also come up) and perhaps with Dynaheir about their culture's attitudes towards death and/or their rituals. BG2 should be interesting; almost every NPC there has suffered a death or loss at some point, some particularly fresh in their minds. Thanks for the suggestions, @Drugar. And thanks for pointing out the sun temple area in SoA. While Helarine makes a by-the-way comment about the death of gods early in her BGEE content, the sun temple would be a great place to elaborate on that. I might need to figure out how to make lines that appear based on conditions within a conversation, to allow for players who don't visit the temple, but that'd certainly be a big reminder. For progress, I've restructured the first 2 conversations after recruiting Helarine. For the most part this is an internal thing that I learned that will cut down on the TLK strings used on redundant branches, but I did remove the ability to skip out of conversations. While the new BGEE NPCs seem to have such things, the way I'm coding these conversations mean that you can't go back to previous talks, and they've been building on each other so I don't want the player to be lost because they skipped something. especially with her revised background which involves hunting Cyric worshippers after the Time of Troubles and before Kelemvor ascends. Thing is, even if I had all the scripting knowledge to pull off confrontations, I want Helarine to stick with the player unless asked to leave. With Tiax, that was actually kinda easy to justify... one of Helarine's banters starts off like a confrontation, but then falls apart when she realizes that Tiax hardly cares what she thinks about him or his god. Of course, these banters aren't very useful right now since I can't seem to figure out the scripting involved to get them working in-game. ANY help here would be appreciated. I might end up just dumping the banters in the main dialogue and using a bunch of fancy variables otherwise. Glad to be of help. Also, while it's Amaunator's temple in the Shade Lord quest, you actually witness him dying in the Unseeing Eye quest. Unfortunately, there's no way of knowing which of the two the player will do first, so you can't neatly sequence a conversation about it, but still. Edit: Looks like all 4 banters work properly under testing conditions. Since they're much easier to write and code than player conversations, I think I'll work on a few more of those before I get too far on the main conversations. That said, I need to get the third conversation draft into the game files... I forgot to take out the script that starts it and that messes with the banters since the conversation doesn't exist yet. I've revised the scripting for Helarine's BGEE "friendship" track, which inludes all the conversations that don't require playing optional content. Separating these conversations from the old number of conversations, there are now 2/7 friendship track dialogues working in-game (one every 20 minutes of real time for the moment). I might reference the main plot in some of these, but in alternate lines (if I can get that to work the way I think I can.) Still not sure what my plan is for player-initiated dialogue, since I spent most of my time on that topic trying to get force talking to work without bugging out the other conversations. In addition, 1/7 of the "special" dialogues have been written. One of these will be a reaction to a plot point late in the game (so too spoily to mention in a progress update), the other six are reactions to romances (2 each, mostly the same with some alternate lines based on the character in question). I'm still working on a way to keep these conversations from breaking the friendship track and vice versa, since they go on a different timer but use a common variable. Since Helarine is technically working in-game and has more content than some of the core characters, I might release an alpha/beta version of the mod soon to get some reactions on how she's being handled so far. Since my exposure to Kelemvor is pretty much limited to wiki entries and Mask of the Betrayer, I want to make sure I'm not straying too far from the lore and setting. I also may need some input on the banters... I already cut a few bits that felt out-of-character but I'm not the best judge of these characters. If you want, you could send me a textfile with the banters and I could look them over. It's probably an easier process than checking all the banters in-game where you have to wait for them to spring up, and I'm a shoddy bugtester anyway. I can check the texts for setting accuracy and provide some input on the characterization of the NPC's (which, of course, are different for everyone but I'll do what I can). @Drugar: Thanks for the offer. I'll try to send you a copy of the current banters once I finish revising one I just added. I've been a bit low on modding time lately due to some other projects I've got going (and because I've spent a lot of time actually playing games), but I have written four new banters. Since I've been slacking on the main PC conversations, I think I'll write at least one more of those before I release my first alpha test. If things go well, I might have something to show next weekend. @Xavioria @Jackkel_Dragon Try the method I use for Isra/Valerie, by using a BAT file to link directly to the TLK. With the amount of non-BG stuff I need to get around to doing, I'm not sure I'll be able to work on Helarine for a bit... I'm still not really happy with the first 3 PC conversations (the only ones written and implemented) but I think I'll make a demo/alpha version available once I find a way to fix the string errors with the creature file name. While I've been low on time to work on this project lately, I have managed to get Helarine into a playable state! Alpha 0.01 is now available on the BioWare Social Network project page (see link in OP). Version 0.02 is up. Not much new content, but some of the bugs in the initial version have been dealt with. I've managed some time to work on version 0.03, which should have the first draft of the entire (6-conversation) friendship path. Only one more conversation to write before that's ready for testing. There are also 6 new banters: 3 with Eldoth, 3 with Edwin. I also tinkered with some possible player-initiated dialogue, but it's not going very well and I might drop it until I have some idea what to do with it. EDIT: 0.03 is coming along pretty well. I *think* I've fixed Helarine's fired/rehired dialogue and prevented her from starting conversations in the middle of combat. I've also fixed a few lore-stretching lines in her dialogues and "soundset" lines and wrote a new banter with Dorn.